LeBron vs. Jordan: Is There a Comparison Yet? LeBron James has just captured his 2nd NBA Championship in as many years, and has secured himself a place as one of the greatest basketball players of all time. And he even did so by overcoming the “Winner of Game 3 wins the series 92% of the time” odds. With the victory, there is a 99% chance the “LeBron is a choker and can’t win the big one” narrative is dead and gone (I say 99% because I’ll never underestimate the ability of Skip Bayless to find a new way to beat a dead horse). But that means that there is another narrative that is going to start being thrown around. Is LeBron James better than basketball’s greatest player of all time….Michael Jordan? Obtain a time machine to travel into the future and see what LeBron does between now and the end of his basketball career. 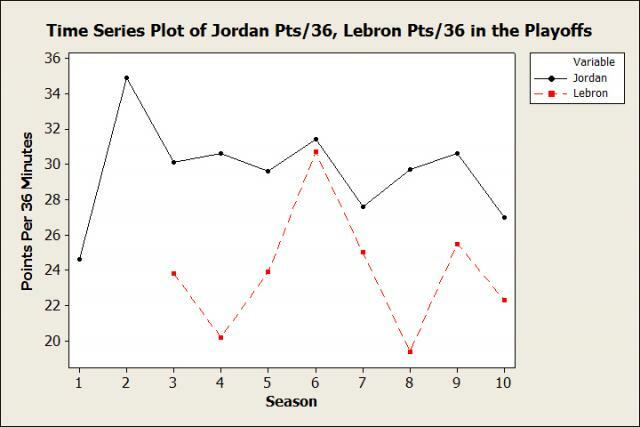 See what Jordan had done when he was at the same point in his career as LeBron is now. I did spend some time looking for a time machine, but I wasn’t able to locate one. So it looks like we’re going to have to go with the second option. Because both players came into the NBA at different ages, I’m not going to use what Jordan had done by the time he was 28. Instead, I’m going to use the number of seasons they’ve been in the league. LeBron has been in the NBA for 10 seasons, so I’m only going to look at what Jordan did in his first 10 seasons. Round 1: How far did you lead your team? Let’s start by seeing how far each player went in the playoffs throughout their first 10 seasons. We’ll use Minitab to make a pie chart to display the results. You can get the data here to follow along, and grab the free trial of our statistical software if you don't already have it. After 10 seasons, Jordan had only 3 of his 6 championships under his belt. Michael actually started his career with 3 straight first round exits and a mere one playoff win. His next three years all included playoff losses to the Detroit Pistons (once in the 2nd round and twice in the Eastern Conference Finals). The last “non-championship” season was in 1995, after his first 3 championships. He returned from retirement with 17 games left in the season and immediately led the Bulls on a 13-4 run going into the playoffs. But they lost to the Orlando Magic in the 2nd round. 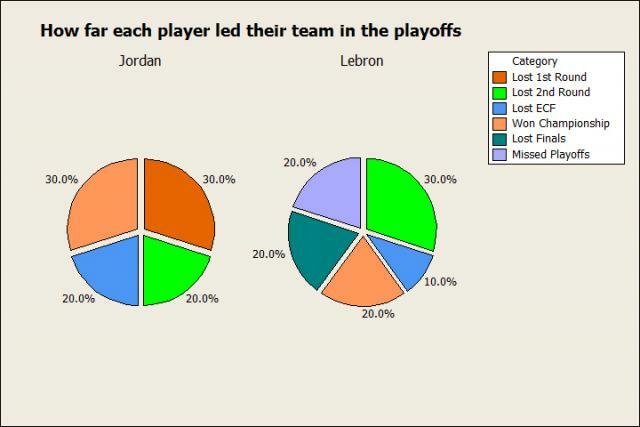 As for LeBron, his pie chart has something on it that Michael never did: a season without a playoff appearance. In fact, LeBron didn’t make the playoffs his first two seasons in the league. LeBron does have more NBA Finals appearances, but he failed to win two of those. Losing in the Finals is also something Jordan never did. Overall, Jordan doesn’t have as big of an advantage as one might expect here. But he does have one more championship and 0 seasons where he missed the playoffs. Round 1 goes to Jordan. Round 2: Who can score more points? Jordan clearly looks like the better player here. His rookie season beats out all but 3 of LeBron’s seasons. And LeBron has never been able to top Jordan when they were at similar points in their career. Another interesting thing to note is that after his first two seasons, Jordan pretty consistently scored about 30 points per 36 minutes in the playoffs. Meanwhile, LeBron is all over the place. That inconsistency is part of the reason he got so much criticism in the past. People expect great players to be great all the time. And if they’re not, well, just ask LeBron James what it was like to be him 2 seasons ago. Round 2 goes to Jordan. Round 3: How efficient were you? How many points you score doesn’t always tell the entire story. If you score 37 points, but it takes you 50 shots to do so, then it really isn’t all that impressive. You didn’t have a great game, you just shot the ball a lot. Plus only looking at scoring doesn’t account for rebounds, assists, steals, turnovers, etc. So I’m going to use a stat called the Player Efficiency Rating (PER). It’s a measure of per-minute production standardized so that the league average is 15. It accounts for both how efficient a player scores, and how they do in the “non-scoring” aspects of the game. It’s the best statistic we have to determine who the best all-around player is. So let’s see who is better! Again, I’m only using playoff games. Jordan isn’t as dominant as he was in the previous plot, but he still looks like the winner. Michael’s least efficient playoff performance still beats half of LeBron’s. And at similar points in their career Jordan wins 5 of the 8 seasons. But James does have the most efficient playoff performance of either player. 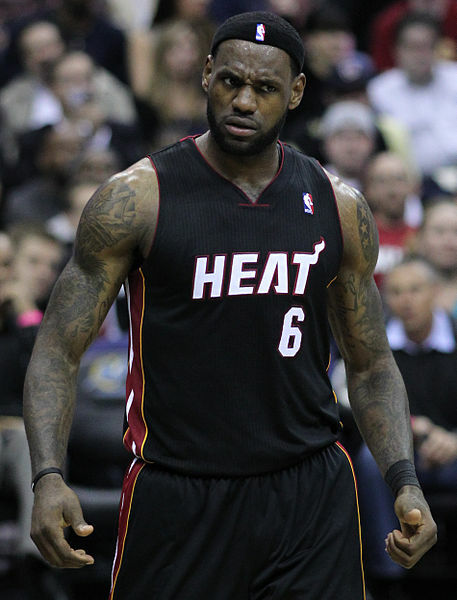 It was the 2009 playoffs, when he led Cleveland to the Eastern Conference Finals only to be upset by the Orlando Magic. In those playoffs, James had three 40-point games and never scored fewer than 25 points. And he did it all while shooting over 50%. Plus, in an elimination game against Orlando he had a triple double and staved off elimination for the Cavs (at least for one game). But after a playoff performance that far exceeded anything Jordan did, LeBron started to get stuck with the “unclutch” label. Sports media everybody! 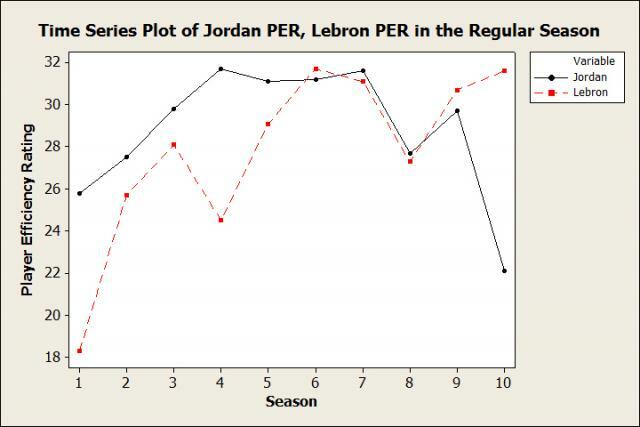 But still, Jordan has the slight edge here. Round 4: Can LeBron at least win the regular season? So far we’ve only looked at what each player has done in the postseason. But it would be mistake to completely ignore the huge sample of games in the regular season, so let’s look at each player’s PER in the regular season. You can clearly see how both players improved in the first few seasons of their career. But Jordan started out playing much better early in his career than LeBron. Then both players followed similar paths after their first 5 seasons. And yes, Jordan has a dip in season 10, but that was when he returned from retirement for 17 regular season games after not playing basketball for 2 years. I wouldn’t put too much stock in that data point. Considering Jordan wins 7 of the 10 seasons and came into the league playing at a much higher level, he wins yet another round. LeBron James is definitely one of the best players ever to play the game. 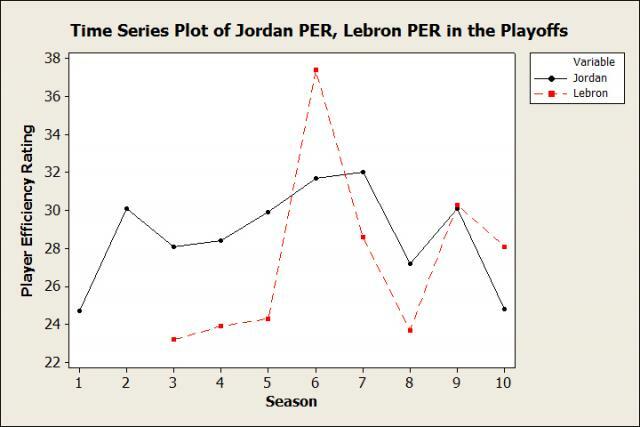 But this statistical analysis shows how hard it is to match what Michael Jordan did. And keep in mind that after his 10th season, all Jordan did was win three more titles in a row. LeBron is young enough that he is more than capable of matching that feat. But even if he does, he’ll be hard pressed to do it with the same efficiency that Jordan did. So at this point in his career, LeBron doesn’t quite measure up to Michael Jordan, and it’s doubtful he ever will. But that doesn’t take away from how great LeBron really is. While he may not be the greatest player of all time, he’s currently the greatest player in the world. So instead of expecting him to live up to unreasonable expectations, we should just sit back, relax, and enjoy the show. Photograph "Lbjheat" by Keith Allison. Licensed under Creative Commons Attribution ShareAlike 2.0.